The Qomrama Om Ya is a weapon of unimaginable power. It was originally designed by a bunch of gods for the specific purpose of killing other gods. And James Stark, a.k.a. Sandman Slim, used to own it until he lost it to a rogue angel named Aelita. Stark doesn't really miss it. But when someone comes looking for it, the inquiry carries side effects. Almost immediately, Stark becomes a target in another power struggle between otherworldly beings. Mostly, he finds it irritating. He had plans to enjoy a quiet life for a spell after his most recent job, being Lucifer, required too much effort. So he split, but not far enough away to keep from being sucked back by the petty "destroy the universe" crowd. Somebody has to shut Angra Om Ya down. Kill City Blues is a supernatural romp through a Santa Monica shopping mall. More than that, Stark is less cocky and more cool. As a nephilim (half-human, half-angel) who has tasted death and temporarily ascended to the top spot in hell for a spell, he has clearly relaxed into a role. There is a certain resignation in his demeanor nowadays, even when it looks like someone might take him to the brink of death. Despite this transformation, he doesn't seem to have a need to go it alone. He welcomes support from his growing entourage — Allegra, Candy, Father Traven, Vidocq, and even his old friend Kasabian. Each of them contributes something to the idea of a protagonist, much like everything inside Kill City begins to take shape an collective antagonist, which is where most of the acton happens. It's an abandoned shopping mall that has turned itself inside out into a sprawling retail wasteland with plenty of unpleasant surprises for anyone who gets too close. The denizens of this world represent the worst of the worst, squatters who have formed tight and deadly tribes to define their their little patches of turf. There are ghosts, lurkers, and bottom-feeding Sub Rosa families that aren't talented enough to make it on the outside. Stark and company have to wade through all of them. And if anything, having them along for the ride keeps him focused. They are all too happy to watch his back too. Not only is it the best chance to reclaim the Qomrama and prevent it from falling into the wrong hands, but he also might be the only one on the planet who can keep the Angra Om Ya from taking it back. A couple of graphs about Richard Kadrey. Few people are cooler than Richard Kadrey. He is a freelance journalist, photographer, and writer who has a knack for flatly calling it like he see it. His work pops up in places like Wired, The San Francisco Chronicle, Discovery Online, and The Site. 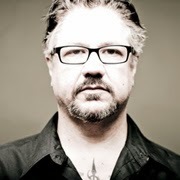 He has written several books and a mini-series comic book for Vertigo, but is best known for the Sandman Slim series. It was picked as one of 13 book listed on Barnes & Noble's "Best Paranormal Fantasy Novels of the Last Decade" list and has showed no signs of slowing. 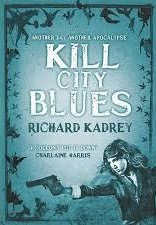 Kill City Blues By Richard Kadrey Carves Out 6.4 On The Liquid Hip Richter Scale. While some people have claimed that Kill City Blues doesn't feel as substantial as previous books in the series, chalk it up to not having a clearly defined antagonist. There is one, to be sure, but the shopping mall seems to play that role more than any single entity. Kill City Blues doesn't disappoint. 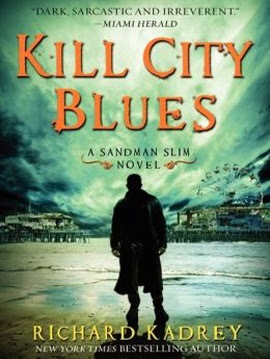 Kill City Blues: A Sandman Slim Novel by Richard Kadrey can be found on Amazon. You can also find the book on Barnes & Noble or download the novel for iBooks. The audiobook is narrated by long-time Sandman Slim voice MacLeod Andrews. The sixth book in the series is expected to arrive in summer 2014. Kadrey also published Dead Set this year.